The Craftsman has a much broader scope and grander ambition than the simple celebration of handmade menswear that we attempt on this site. In his book, Richard Sennett aims to show how the quality of product and personal pride that result from manual manufacture can be extended to all fields of human work. Whether a scientist in a laboratory or a chef in a kitchen, the common themes of craft – allowing time to develop expertise, the ability to stand back and reflect on work – can help anyone can get more out of what they do to earn a living. But there are still many parts of this book that readers will identify with and enjoy. 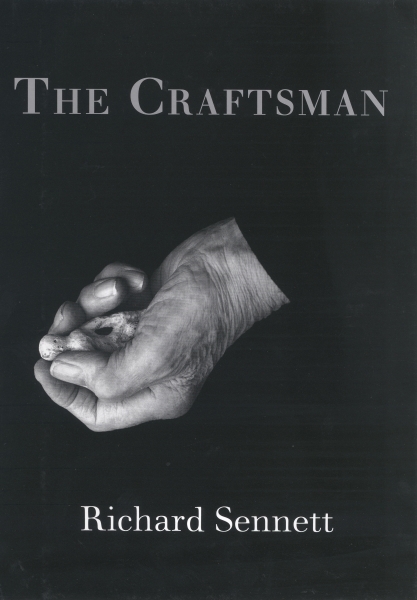 Stories of craftsmen such as Len Greenham, for example, a leather bookbinder in Northampton and the last of a family that has always done something called morocco-graining. Or the benefits and dangers of the spread of craft techniques through the internet. Interesting, too, is Sennett’s rejection of adjectives like ‘traditional’, ‘original’, ‘natural’ in describing craft and product. Not because he has to put up with the same marketing bullsh*t as us, but because he dislikes these Romantic values and the romanticising of craft for its own sake. This reminds me of the need to objectively evaluate the handwork we admire: what has practical value, aesthetic value or neither. Rather than the Romantic, Sennett comments the Enlightenment attitude to craft, and his description of its approach to machinery bears repeating: “The enlightened way to use a machine is to judge its powers, fashion its uses, in light of our own limits rather than the machine’s potential,” he says. The fact that machines can now hand-link the toe of a sock is something to celebrate. The invention should “propose rather than command”. A good read by a great sociologist. And it will teach you more about cooking than you might expect. You can follow the discussion on The Craftsman, by Richard Sennett by entering your email address in the box below. You will then receive an email every time a new comment is added. These will also contain a link to a page where you can stop the alerts, and remove all of your related data from the site.